Sea level had risen during the 7th millennium BC, increasing to a maximum of 10 meters above the current level. 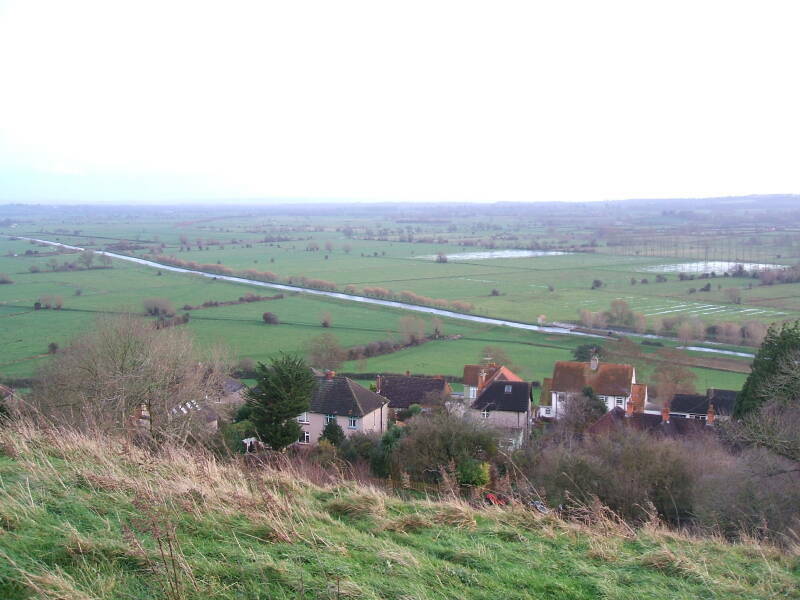 By about two thousand years ago it was well on its way back down, but the lowlands of the Somerset Levels would still flood in the winter as they average just about six meters above the current sea level. Some areas are at or slightly below today's high tide level. 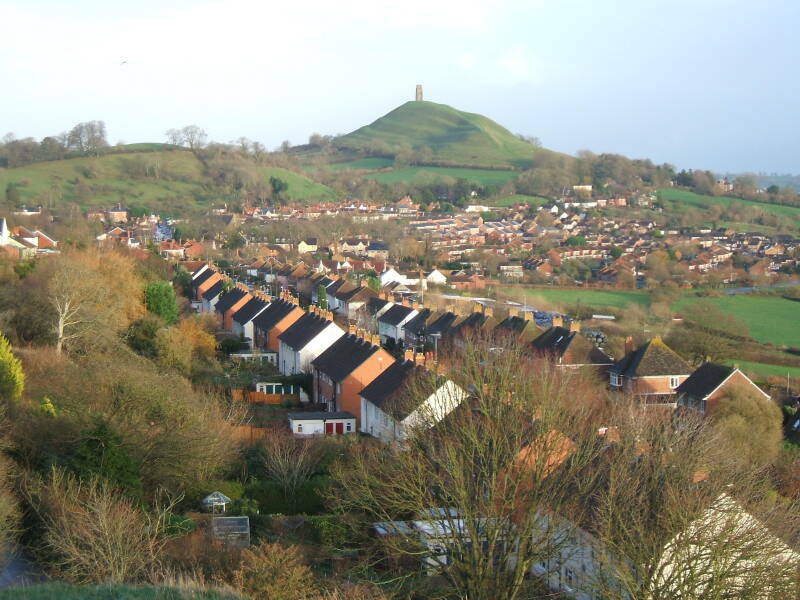 Wearyall Hill lies to the south-west of the town of Glastonbury. When the low surrounding land was flooded, this would have been an island rising out of a swampy shallow bay connecting to the Severn and the Atlantic Ocean. 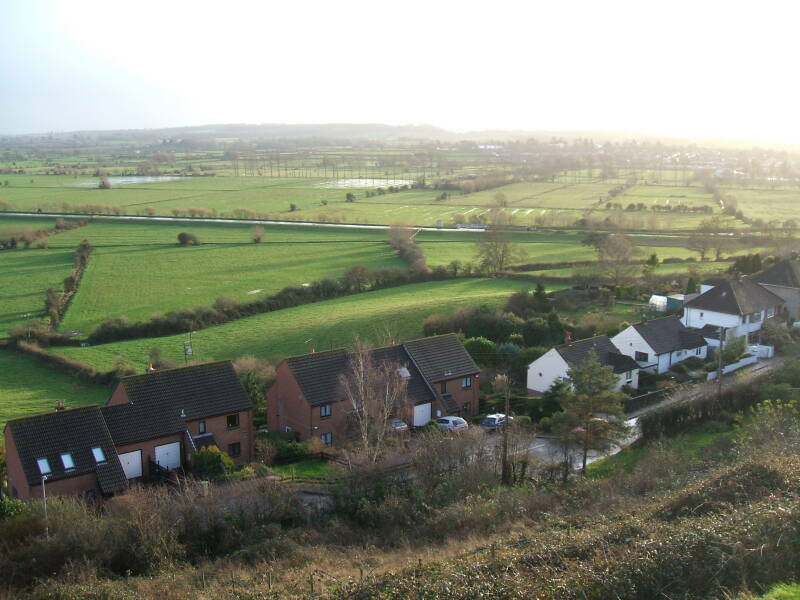 The legend of Joseph of Arimathea says that he would have arrived by boat when the Levels were flooded, landing on the island formed by Wearyall Hill. 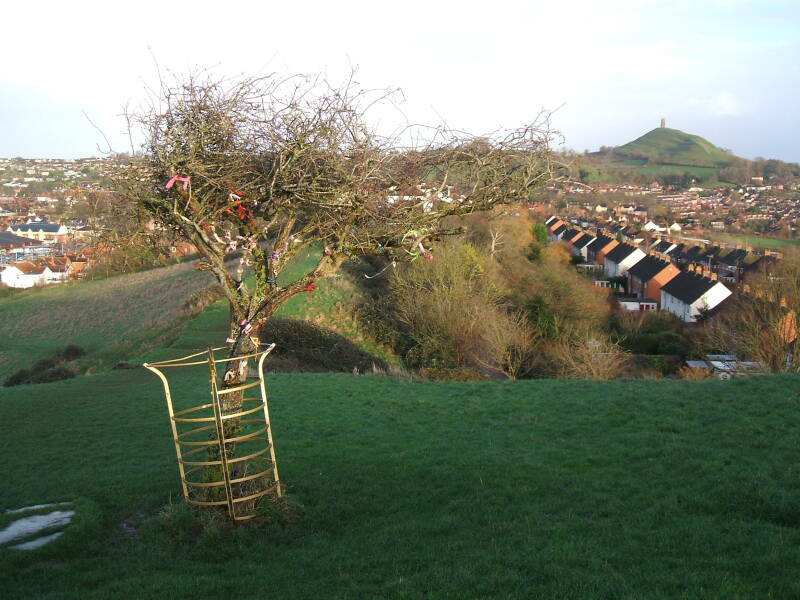 The story of the Glastonbury Thorn is that Joseph of Arimathea was using a hawthorn stick as a walking staff. When his party came ashore he stuck his staff into the ground and it immediately blossomed and took root. 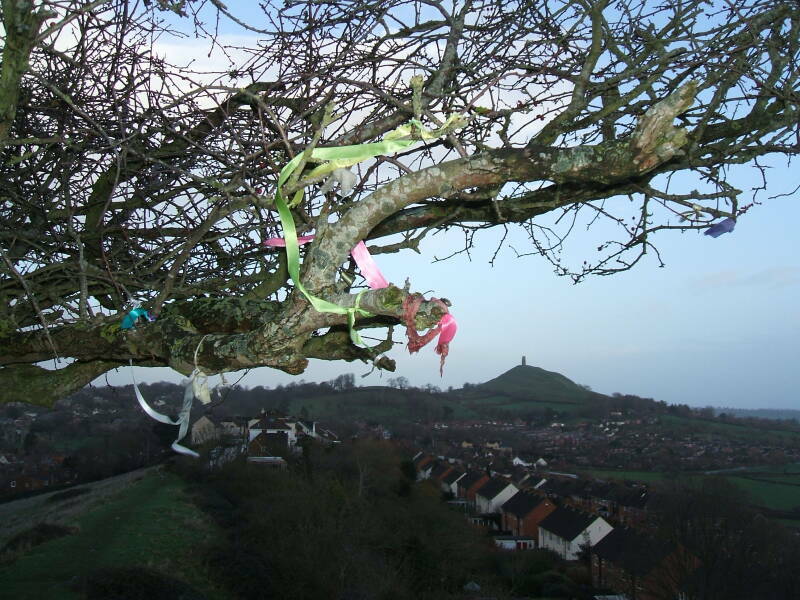 Here we're on Wearyall Hill with one of these thorn trees, with the Tor visible in the distance. The wondrously blossoming staff is a common legendary item. It goes back at least to the staff of Aaron, Moses' brother. To desert tribesmen like the Israelites, a rod or staff is a natural symbol of authority. In Numbers 17 Moses had proclaimed that the tribe of Levi would form the priesthood and the other Twelve Tribes were in rebellion. To put an end to their infighting, each of the Twelve Tribes was to provide a rod. Aaron, representing the tribe of Levi, provided his rod which had already performed miracles. Overnight it "put forth buds, produced blossoms, and bore ripe almonds." The tree became famous in the 17th century, leading to its partial destruction. Bishop Goodman of Gloucester reported in 1653 that a fanatical puritan decided to cut it down. He got as far as cutting one of its two trunks most of the way through when his reckless excitement led to injury. It wasn't fatal, but it was bad enough that he stopped with one trunk mostly but not entirely cut through. That trunk fell but was still connected to the root system well enough to continue to bear leaves and blossoms for another thirty years. Then Oliver Cromwell's forces did a complete job of destroying the tree. New shoots would appear and then suspiciously disappear a few days or weeks later. Then in April, 2012, they planted another sapling grafted from early specimens. But 16 days later it was destroyed. A Paleolithic flint tool dating to about 500,000 years ago was found in Westbury. The area has been occupied for a long time. During the Pleistocene glaciation, from about 110,000 to 10,000 years ago, the sea level was significantly lower because enormous amounts of water were frozen in glaciers. The maximum extent of glaciation was about 22,000 years ago, then the glaciers largely melted and the sea level rose. 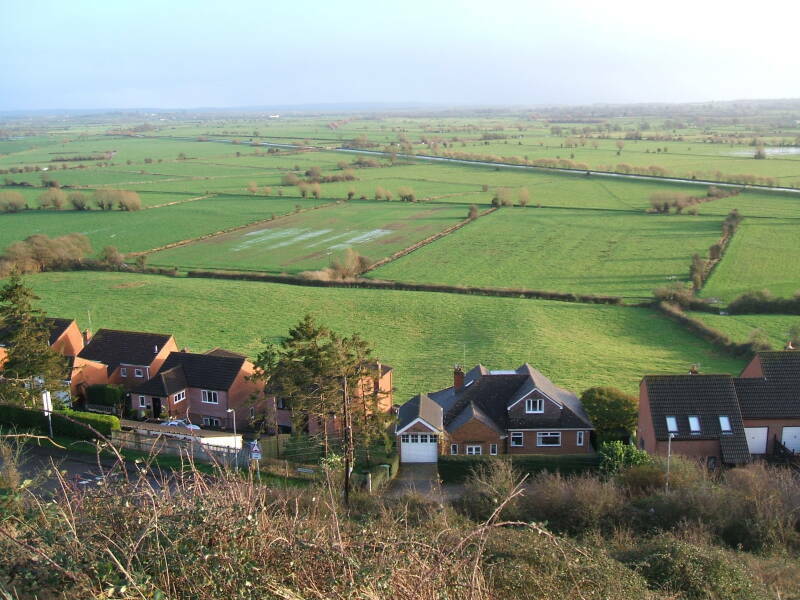 With sea level much higher during the 7th millennium BC, increasing to a maximum of 10 meters above the current level, the Somerset Levels were flooded and formed a very shallow bay connected to the Severn and thus the Atlantic Ocean. The area we're seeing here would have been covered with water to that far line of hills. Mesolithic people established some seasonal camps on higher ground, hills like Wearyall and the Tor which were islands at the time, and the lines of the Mendip Hills to the north and Blackdown Hills to the south. Around 5000 BC the local culture advanced to the level called Neolithic with the development of agriculture, domestication of dogs, sheep and goats, and the use of pottery. These Neolithic people continued living in the area. They kept cattle, sheep and goats, and would have hunted and fished along with raising some crops. The Levels are soft and wet even when slightly above sea level. Large areas of peat were deposited after the ice sheets melted 10,000 to 15,000 years ago. In 1970 Ray Sweet was excavating peat and discovered a wooden trackway built by the Neolithic people. His company sent one of the planks to Cambridge University, and a team came and studied the trackways crossing the Levels to connect Neolithic settlements. Dendrochronology or precise dating through tree-ring patterns allowed the trackway's construction to be dated to one of two years, 3807 or 3806 BC. This path is called the Sweet Track after its discoverer. It was called the oldest roadway in the world until an even older track was found in south-eastern London. The Neolithic people drove crossed wooden poles mostly of ash and oak into the waterlogged soil, with planks mostly of oak laid between the X-shaped supports. The planks of the walking surface were up to 40 centimeters wide and 3 meters long. The wood was preserved by being buried in the acidic and anaerobic environment of the bog. A axe head made from jadeite or NaAlSi2O6 was discovered beside the trackway. The jadeite would have been obtained in trade from the mountains of northern Italy. It is one of about 100 similar axe heads found in Britain and Ireland. It was in good condition and made from material that was precious and difficult to work but would not produce useful wood cutting tools. The poles and planks for the trackways were cut with stone axes and wooden wedges and mallets. These jadeite axe heads are thought to be symbolic, left in the bog as an offering. The Celts and Romans made sacred offerings by depositing weapons and cauldrons in water. The concept seems to have started even earlier. Excalibur was King Arthur's legendary sword, attributed with magical powers and the proper sovereignty of Britain. In Welsh, the source of the name and the legend, it's called Caledfwlch. The Cornish speakers of far south-western Britain called it Calesvol. Geoffrey of Monmouth Latinized Caledfwlch to Caliburnus, which then became Calabrum, Calibourne, Escalibor, Excalibur, and similar in medieval French. Peasant: Listen, strange women lyin' in ponds distributin' swords is no basis for a system of government. Supreme executive power derives from a mandate from the masses, not from some farcical aquatic ceremony. In Robert de Boron's Merlin Arthur pulled Excalibur from a stone and thereby was proclaimed king. In later stories the Lady of the Lake gave Excalibur to Arthur after he had taken the throne. When he is mortally wounded, Arthur commands one of his knights to throw Excalibur into the water to return it to the Lady of the Lake. Many versions said that Excalibur was engraved on both sides with words. Malory wrote, "Thenne he drewe his swerd Excalibur, but it was so breyght in his enemyes eyen that it gaf light lyke thirty torchys." It was really, really shiny. Excalibur's scabbard was also said to have magical powers. For example, its bearer would not die from loss of blood. Then Morgan le Fay stole the scabbard and threw that into a lake. Welsh tradition also tells of Arthur's dagger named Carnwennan or "Little White-Hilt" and a spear named Rhongomyniad or "Slayer Spear". A Middle English poem tells of Clarent, a sword of peace intended for ceremonial use only; Mordred stole it and used it to kill Arthur. It gets confusing, with different versions disagreeing about which knight returned Excalibur, and the drawing of a sword from a stone signifying both that Arthur would be king and that Galahad would find the Holy Grail. The common thread is that whichever version you follow, there is the sacrifice of depositing a fine weapon or other valuable metal object in a body of water. These are stories from the deep history of Europe. In Norse mythology, a very tall one-eyed man appears at a feast. It is Odin in disguise. He embeds the sword Gram in the tree Barnstokkr, saying that it will belong to whoever can pull it out will find that they never carry a better sword. The hero Sigmund, father of Sigurd, drew out the sword. The area continued to be inhabited through the Bronze Age. Hill forts and other settlements were built on high ground. With bronze technology, now some metal objects were deposited in the bogs as devotional offerings. Causeways continued to be built across the wetlands, 11 Bronze Age causeways are known today. 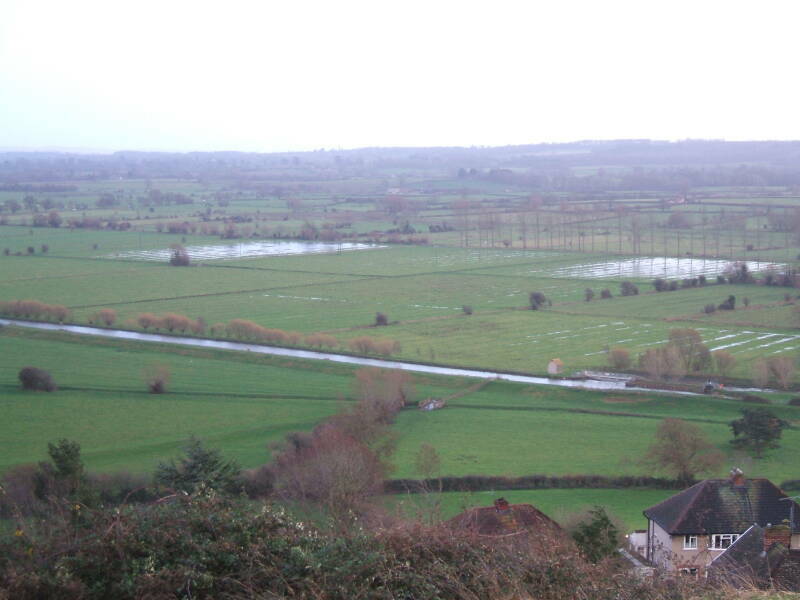 The Tor is another outcropping rising above the low wet plain of the Levels. It is taller and conical, versus the lower ridge of Wearyall Hill. Let's walk from Wearyall Hill to the Tor! But watch out for the mud! The UK has a wonderful system of public access to walking paths. 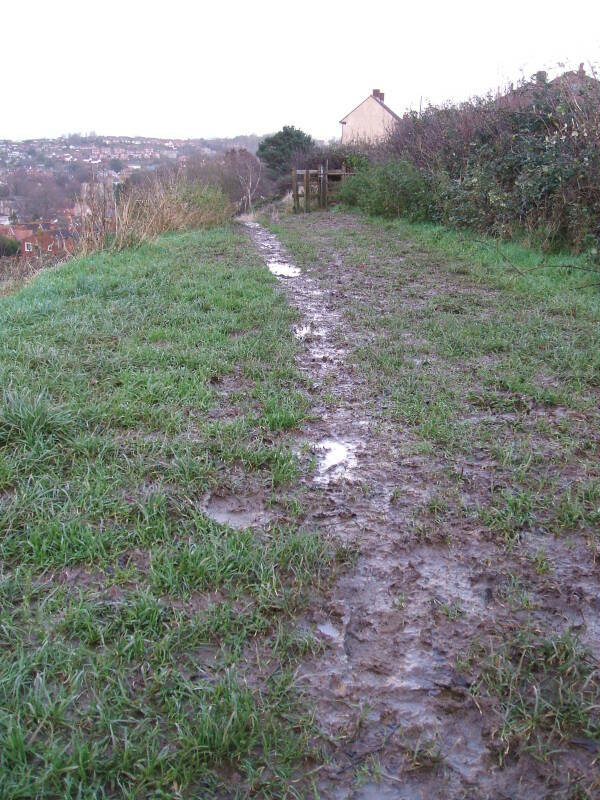 The paths can be very muddy, as many people take advantage of the Right of Way. 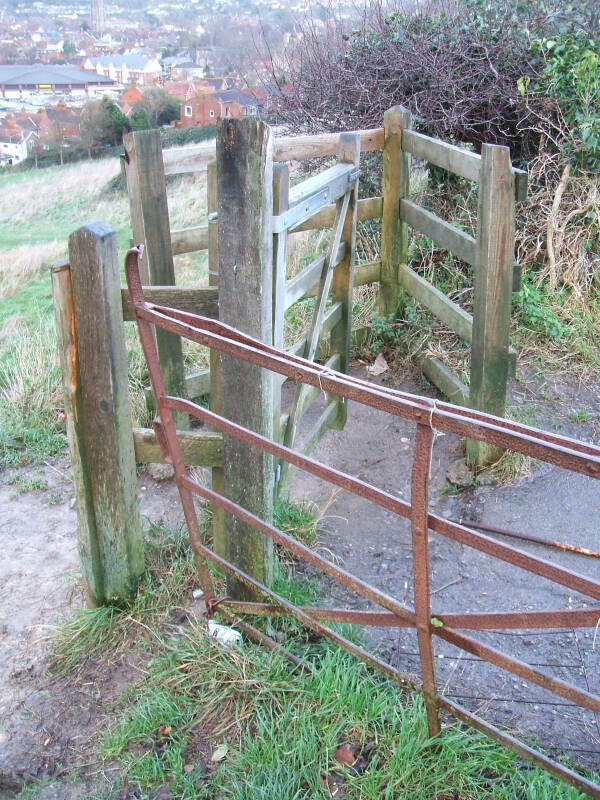 Stay on the marked paths, and make sure to use the gates properly. We will continue our tour by stopping at the Chalice Well on our way to the Tor.